Just off the Champs Elysees, individually designed rooms by Pierre-Yves Rocho featuring antiques and 18th-century oil paintings. 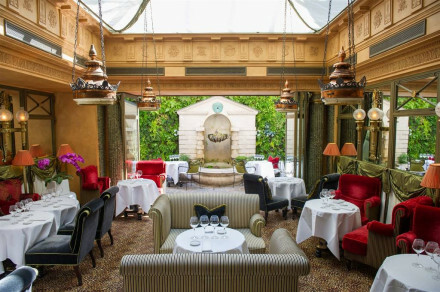 Sumptuous silk and damask fabrics, Eiffel Tower views and romantic dining in the glass roofed winter garden- heaven! Public parking avaliable, charges applicable. Start your night with a cocktail at the bar, then step out to one of the many Michelin Star restaurants that litter this area. The Grand Palais, just around the corner, is one of the most popular exhibtion grounds in Paris. Head down to the Seine and walk her banks taking in the sights and scenes that unfold. Just off the Champs Elysees, within a five minute walk of Arc de Triomphe de l'Étoile. Surrounded by Haute Couturiers, just five minutes from Avenue Montaigne. “Why do people love staying in your hotel? Outstanding location and authentic style of the property. Guests enjoy the key location of the hotel, just near the fine boutiques of the Avenue Montaigne and the majestic Grand Palais where major exhibitions and events take place throughout the year, such as: Fashion Shows, Art Fairs, Painting exhibitions, International Hermès Jumping, Antique Fairs, etc. 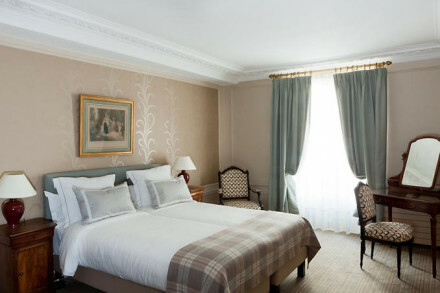 Also the hotel is set in the exquisite decor of a 19th century private home, providing guests with a unique Parisian experience. The authentic architecture, fine materials, antique furniture and works of art, friendly staff together with the intimate atmosphere of a family home, make the success of the hotel. What is there to do in the area? Fashion, Culture and Entertainment. 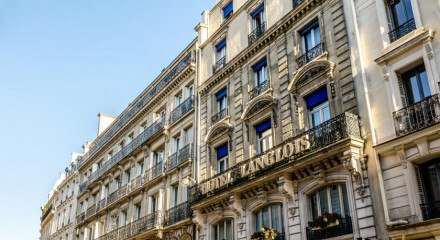 - Fine shopping on the Avenue Montaigne (200 meters from the hotel): Christian Dior, Versace, Ferragamo, Louis Vuitton, Gucci, Armani, Ralph Lauren, etc. - Culture and monuments: exhibitions and events at the Grand Palais (200 meters from the hotel), but also Petit Palais, Alexandre III Bridge, River Seine, Yves Saint-Laurent Museum, Grand Musée du Parfum, Invalides are all at easy walking distance. Eiffel Tower, Concorde and Arc de Triomphe can be reached after a 20 minutes nice walking. - Entertainment: many theatres and cabarets are at walking distance, especially Champs-Elysées Theatre, Crazy Horse, Lido, Cinemas on the Champs-Elysées Avenue. - Many activities can be organised through the Concierge: cooking classes, private guided tour, wine tasting, etc. What kind of breakfast do you offer? Buffet breakfast and American à la carte breakfast. Buffet breakfast is served every day at the Restaurant, offering the traditional continental selection and adding the scrambled eggs, delicatessen and cheeses. At extra charge, à la carte choice: minute maid omelettes, smoked salmon Petrossian, French toasts, Pancakes with Maple Syrup, Sausages, etc. Continental or à la carte breakfast can be served in room. Buffet breakfast is 35 € per person. Do you offer other meals? And can you recommend good places to eat out locally? YES, in our Restaurant Les Confidences. Our Restaurant Les Confidences offers a revisited French Cuisine, healthy and lighter, based on seasonal products and respectful of the environment. Green wines are also suggested. Flavour, décor and freshness remain the assets of the Restaurant Menu, going with the exclusive garden design set under a magnificent glass-roof. Our Concierge can recommend other places, brasserie to gourmet restaurants, matching with the clients’ tastes and expectations. The most popular rooms are the Terrace Junior Suites: located at the upper floors of the hotel, they benefit from a terrace and a beautiful view on the Eiffel Tower. Because we have only 4 Terrace Junior Suites, two nights minimum stay is requested for booking. With the same state of mind in terms of decoration, each one offers a unique setting, with different colours, fine fabrics, silk wallpaper, marble bathrooms and a comfortable sitting area. Comfortable accommodations fit the requirements of Families, especially the Family Suite composed with two Deluxe Bedrooms connecting with a separate living-room, but also the combination of one Deluxe Room connecting with one Classic Room. On a request basis, our Concierge can arrange the service of baby-sitting (at charge). Different activities can be enjoyed in Paris for children: our Concierge can recommend the suitable places according to the children age.